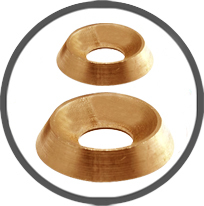 Brass Cup Washers are usually made of light gauge steel, brass, leather, or plastic in a wide range of sizes and designs. Mainly used for decorative or supportive element for screws and bolts. It is also used in insulation. 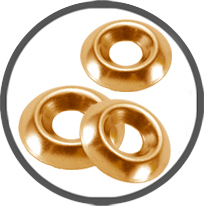 We manufacture Brass Cup Washers in every material such as Brass, Copper, Aluminium, Fibre, Mild Steel (M.S. ), Stainless Steel ( Grade 201,202,304,316, 316L, 400 etc), Carbon Steel, Spring Steel, High Tensile Steel, Rubber, Plastic, Teflon, Berrylium Copper, Haste Alloy, Alloy steel, Monel Etc. Washers are available as per Din, Indian Standards (I.S. ), Japanese Standards (J.S. ), British Standards (B.S.) & American Standards. 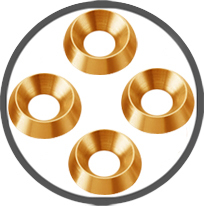 Special Washers can be manufactured as per I.D., O.D. & thickness requirement, as per your drawing or as per the sample you provide. These are similar to Disc washers.